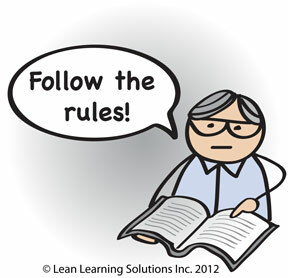 This is the third in a series of blogs which get back to the basics of Lean. The purpose of these blogs is to get back to the basic principles of Lean and stop contorting Lean into something it was never meant to be. In the first blog I started right at the beginning with Customer Value. Makes sense since everything we do should add value to Customers. Then I moved onto Employee Engagement. Today, I’d like to talk about Visual Order which many of you may know as 5S. Why is this one of the basics? It’s the very foundation on which almost everything else builds. In my consulting practice, I tell my clients that if you can’t sustain a good 5S program, then how can you possibly think you can sustain anything else. Let’s examine Standardized Work. Without a good 5S program, there would be no way to sustain or follow the Standardized Work without interruptions and disruptions constantly breaking the cycle. Looking for parts or supplies are just a few of the obvious wastes. What do I mean by Visual Order or 5S? It refers to a system of organizing the workplace based on 5 Japanese words all starting with the letter S. I’ll use the English equivalents for simplicity. Sort – remove anything that doesn’t have an immediate need. This is often called a Red Tag process and doesn’t mean throw things out. For things used in-frequently they could be put into a special storage area. Other items will have uses elsewhere in the organization so a disposition process needs to be developed. Finally some items will be given away or scrapped. Set in Order – The remaining items are organized with a fixed location that specifies what goes where. This is called a home position so we know where to find every item. These positions are them labelled so everyone can see. Standardize – Develop standards for each of the first 3 steps, including the who, when, where, what and how to do each of them. Why do I prefer the name Visual Order rather than 5S? It’s really a way of visually organizing the workplace to make it easy to see abnormalities. As we’ll learn in the next blog on Visual Management, this is a cornerstone of visual controls. The need for everyone to be able to see the abnormalities so we can take action on them. Once we have learned the techniques of Visual Order and have learned how to see abnormalities, we need to work on preventing the abnormalities from occurring in the first place. This often overlooked part of the Visual Order system, is critical to developing the thinking and problem solving skills of our team members. These skills once learned, can then be applied to other areas such as an office environment or even a virtual environment such as a computer drive. As with many things with Lean, we can take the basics deeper and deeper. What once was a simple tool now becomes a critical way of thinking.